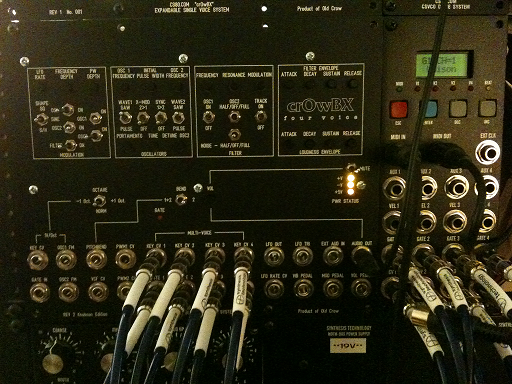 The crOwBX project began the day after I played a vintage Oberheim OBX at AHMW 2013. Seeing as the price of OBXs was beyond crazy, I figured it would be cheaper to just make enough of one so as to obtain that sound. 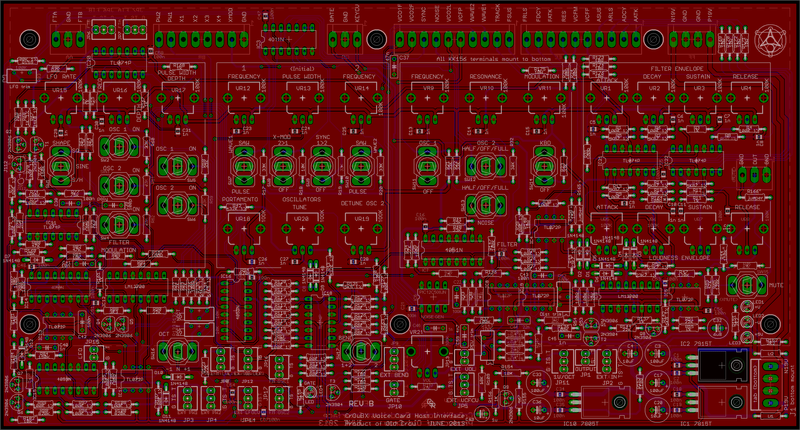 I had to design discrete equivalent circuits for the hard-to-find custom envelope generators, revise the VCOs and filters to use parts than can still be purchased economically and design my own host interface for driving all the parameters of an all-manual 4-voice system. 3,000 parts and most of the summer later, the crOwBX 4-voice rackmount synthesizer is complete...and I got what I wanted. And yes, the voice boards are a drop-in retrofit for a vintage OBX. Follow the story of the crOwBX on Muffwiggler! This project is dedicated to the memory of the brother I never met face to face, Jurgen Haible. He would have loved this thing. Peace to you my friend. And, of course, a huge thank you to Tom Oberheim for creating the awesome OBX. Bare Board Sets -- Order Here! Fair warning: altogther there are about 3,000 components in a 4-voice crOwBX which includes the electronic components, hardware (screws, etc.) jacks, wiring--what have you. It took me 3 weeks of evenings soldering and physical assembly to build the rev2. Not trying to scare anyone, but it is important to understand the scope of the build from the outset. 2) Check V+ to GND, V- to GND and +5V to GND (host board) to be certain there are no power rail shorts. 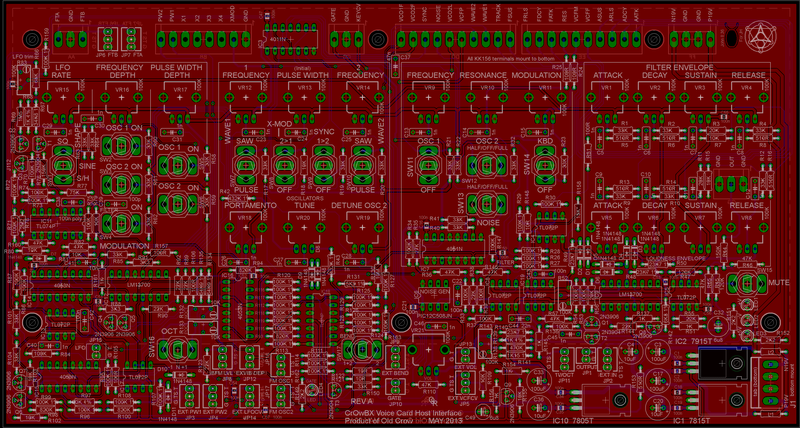 3) Install voltage regulators and aluminum capacitors. Observe capacitor mounting guildlines in the parts lists. 4) Apply +/-19V to the power connector with clip leads, verify the regulated voltages are present at their proper values. Optionally check each IC position for the correct voltages on the expected supply pads. 6) Install remaining through-hole capacitors. 7) Install transistors. Pay attention to J112 FET orientation notes in the parts lists. 8) Install ICs. Be aware not all ICs orient in the same direction. Recommend socket for the PIC. Optionally socket LM13600s and 4051/4052/4053s. 9) Install Molex headers and connectors. Be careful to align these Molex parts as best as possible with respect to the silkscreen. 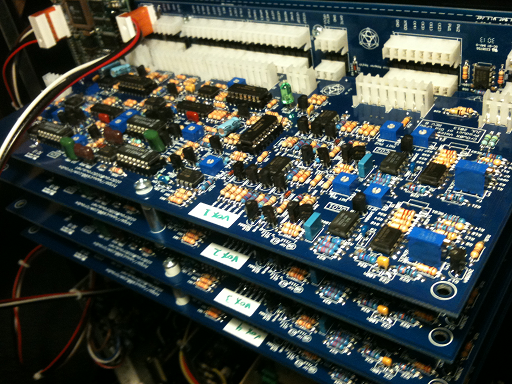 10) Host board: install 9mm potentiomters. The host board switches, if using my .fpd panel, need to be dropped into their positions on the board but not yet soldered. The panel is then placed over the switches and each switch is nudged until it seats into its drilled hole. This part is somewhat tricky as there are 17 switches to deal with. When properly seated, all the switches (with a lock washer and lip washer between the switch and panel) can then have a panel nut placed on the bushing but do not tighten them fully until the alignment of each switch in its solder pads is adjusted. I like to choose two switches at opposing corners, such as the LFO wave select and mute, line them up and solder them in then work with the remaining switches. It will take a while. 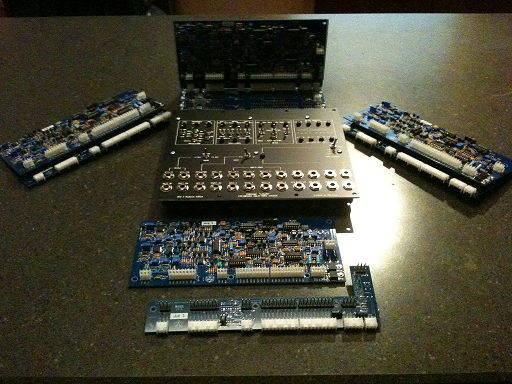 Noise Generator Test -- the noise generator is a PIC, one of two logic parts in an otherwise all-analog system. Unison resonant filter sweep -- the filters do not track octaves precisely, which results in this pleasing spread spectrum. Sweep with Portamento -- individiual lag circuits per voice create a staggered effect.